I took five Excelsior College Exams while I was in country in Afghanistan in 2010. It was a process to study and learn the material but it was extremely flexible. Excelsior College® Examinations, a tuition-saving, independent study option for college students and college-bound high schoolers seeking college-level credit, are now more accessible at 4,000 Pearson VUE testing centers in the U.S. and abroad. This is an increase of 2,900 test sites for Excelsior College Examinations (ECEs), a program of Excelsior College, a nonprofit, regionally accredited distance learning institution based in Albany, N.Y. Earning college credit by examination is a recognized method of demonstrating college-level knowledge gained through independent study, on the job, or through other means. ECEs and the related UExcel® exams(already available at the 4,000 test sites) are the only college-affiliated credit-by-exam programs that lead to a letter grade on a college transcript. Earning credit by examination can help significantly reduce the overall cost of attaining a degree. Based on a typical 30 credit-hour load per year, and annual tuition and fees reported by The College Board, the cost per credit hour via a semester-long course at a four-year institution can range between $254 at public colleges to $910 at private, nonprofit schools. By contrast, depending upon the length of an exam and the total credit awarded, the per-credit cost for an Excelsior College Examination averages $75. ECEs and UExcel exams have been evaluated and recommended for college-level credit by the American Council on Education’s College Credit Recommendation Service (ACE CREDIT). 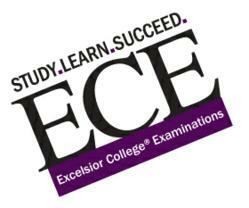 Between June 1, 2010 and May 31, 2011, Excelsior awarded 99,277 credits to 29,572 students through the ECE and UExcel examination programs. The data reflects a per-student median of six credits earned through examination. Students can request that a transcript of their credits be sent to another institution, or have the credits applied toward an Excelsior College degree. ECEs cover more than 40 subject areas in which students can earn between three and eight college-level credits at upper- and lower-levels in subjects ranging from microbiology and business to philosophy, psychology, history and other subjects. UExcel offers seven lower-level exams, which offer between three and six credits. In addition to expanding test site access, in July 2011 the testing time for 10 ECEs has been reduced to two-hours and the cost for these 10 exams has dropped to $95. Corresponding practice exams for these 10 tests are priced at $25. These pricing changes and test site expansion are part of Excelsior’s strategy to meet growing demand for more affordable higher education options that maintain college-level rigor and quality. For John J. Armstrong, a veteran and New York resident, ECEs enabled him to complete his college degree while deployed abroad. “I took five Excelsior College Examinations while I was in country in Afghanistan in 2010," said Armstrong. "It was a challenging process to study and learn the material, but it was extremely flexible. You need to be a good test taker, but that's something you can learn to do." Learn more about one graduate's experience with ECEs. Excelsior College Examinations and UExcel tests are administered globally in secure environments at Pearson Professional Centers, and via Pearson VUE academic testing centers in schools, community colleges, nonprofit training centers and other educational and business settings. Organizations such as national medical boards, state licensing boards and major IT certification programs rely on Pearson VUE to provide safe, convenient and secure testing sites for their examinations. Excelsior College is a regionally accredited, nonprofit distance learning institution that focuses on removing obstacles to the educational goals of adult learners. Founded in 1971 and located in Albany, NY, Excelsior is a proven leader in the assessment and validation of student knowledge. It offers more efficient and affordable access to degree completion through multiple avenues: its own online courses and college-level competency examinations, and the acceptance in transfer of credit from other colleges and universities as well as recognized corporate and military training programs. Excelsior College is accredited by the Middle States Commission on Higher Education. Pearson VUE (http://www.pearsonvue.com) is the global leader in computer-based testing for information technology and academic, government, and professional testing programs around the world. Pearson VUE provides a full suite of services from test development to data management, and delivers exams through the world's largest and most secure network of test centers in 165 countries. Pearson VUE is a business unit of Pearson, the international media company, whose businesses include the Financial Times Group, Pearson Education and the Penguin Group.